Results come when enthusiasm is abundant! 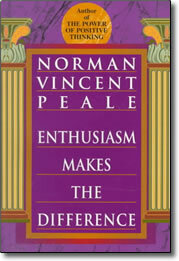 In this rich, rewarding book, Dr. Norman Vincent Peale brings the problems of today into focus and provides hard-hitting, practical advice on how to cope with them by boosting the enthusiasm you bring to each day. If you have a tough time coping with life’s disturbances, disappointments, and challenges, this book is for you. Dr. Peale offers a simple, sure-fire solution for stress: a healthy dose of enthusiasm.